Evie here. This painting is for Nikky @nikkybon81 In the midst of mourning the loss of her brother, Osiris came into her life and they rescued each other. Osiris has seen Nikky through some very difficult times. Even though he is gone, here are 10 facts that Nikky would like to share about Osiris: 1. I rescued him when he was about 8 months old. The shelter was going to euthanize him because he had a really bad case of demodex and I was told "no one will ever want him, he has no hair and he is a pit bull!" I fell in love with his eyes and had to save him. 2. He was named after the Egyptian God Osiris. At the time I had a boxer named Isis. 3. He started donating blood to dogs in need when he was probably 2 years old, before him my boxer Isis donated. 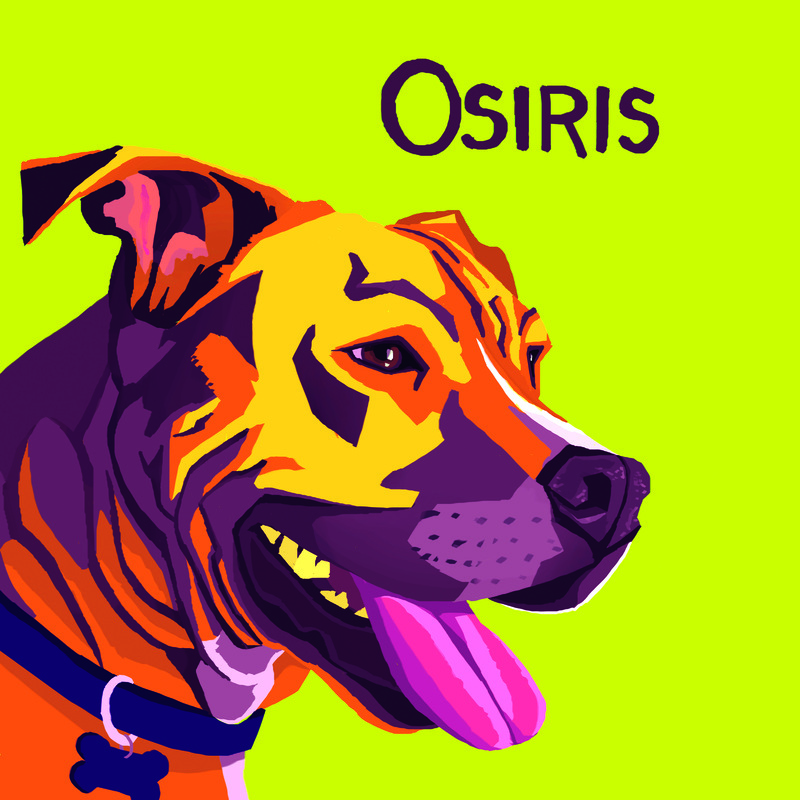 Osiris saved around 9 to 10 dogs in his lifetime. 4. Osiris is the reason why I became such a pittie lover and supporter and advocate. He definitely changed a bunch of people's opinions about the breed. Some even lovingly refer to him as their favorite ambassador for the breed. 5. He was my reason for every choice I ever made when he was in my life. He was my heart. 6. He could bring a smile to anyone's face and he seemed to know exactly who needed some love or a laugh. 7. He had such a gentle way about him and was a foster dad to numerous kittens and puppies. He LOVED when I brought bottle babies home. 8. Everyone Osiris met was his new best friend but he was definitely a mama's boy and adored my little brother Jonathan. 9. He loved the beach, he loved swimming and even stealing the body board from my siblings and riding it. 10. Osiris was and is the best thing that has ever happened to me. He was my heart, my love, my son, my all.